Jordan Mayberry sits at the kitchen table in the camper her family has lived in since Hurricane Irma destroyed their home in Everglades City. 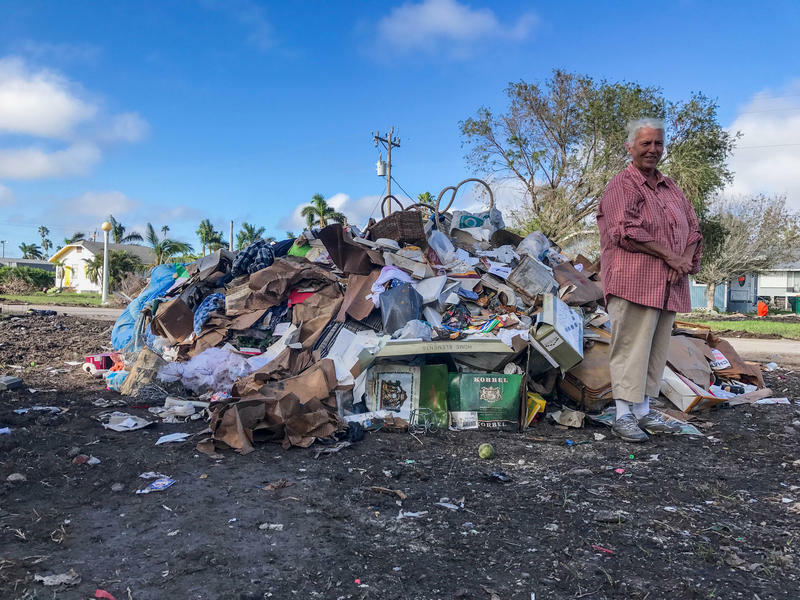 Days away from the official start of the Atlantic hurricane season and days after subtropical storm Alberto made landfall in Florida, Everglades City was still trying to piece itself back together, more than eight months after Hurricane Irma. We first met Jordan Mayberry a week after the storm– on the steps of her ruined home. 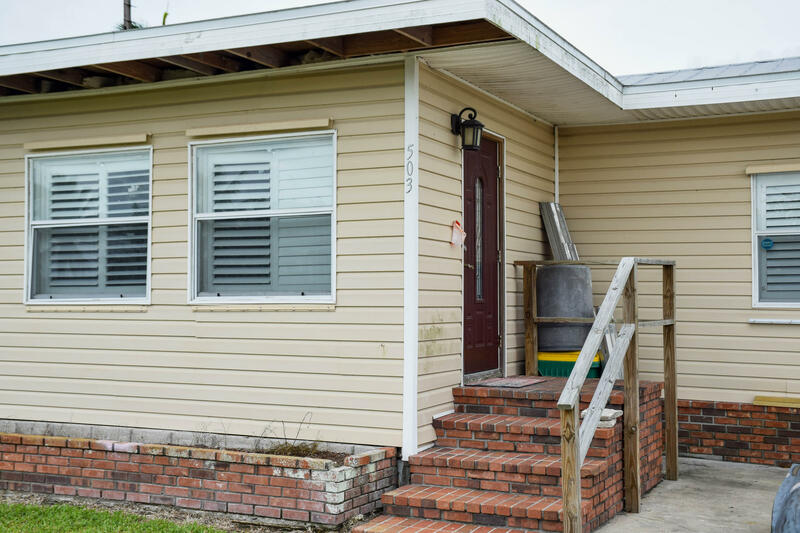 Mayberry and her husband worked paycheck to paycheck for three years to pay for the renovations to their dream home – only to have Irma’s 10-foot storm surge wash it all away. The 31-year-old mother of two stood in her muddy yard, surrounded by pieces of her new fence, and said, despite everything, she was grateful. “We lost our homes, but we found humanity," Mayberry said. "Everglades City is a very close community." Jordan Mayberry holds up the peeling sign on the side of her family's ruined home. It warns to enter at one's own risk. Now, more than eight months after the devastation, Mayberry says that community – that "family" – is how they’ve gotten through it. She says they’re “lucky” that Everglades City has allowed its residents to live in trailers on their properties. 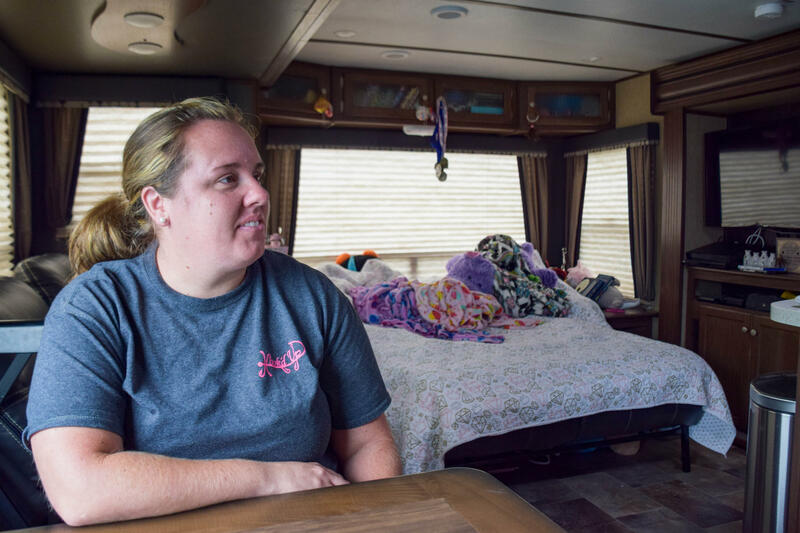 “We are in our camper, and this is post-Irma," Mayberry said. 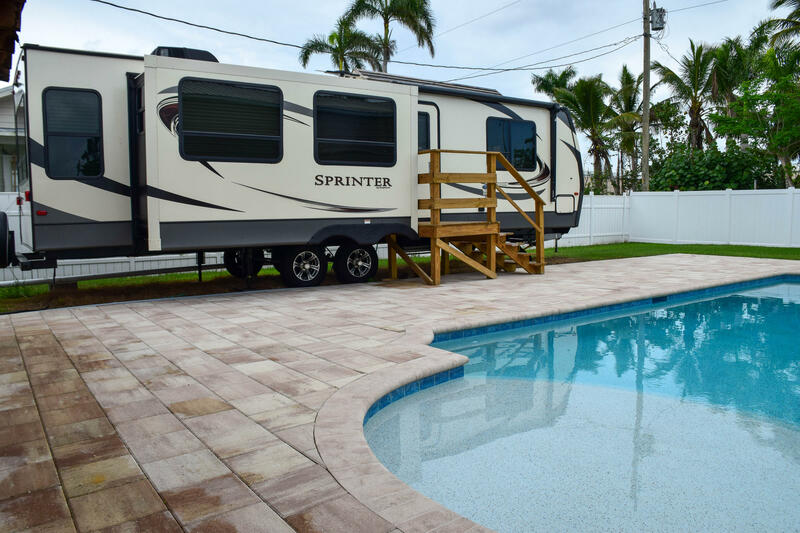 "Our camper’s placed in our backyard." The camper the four members of the Mayberry family live in. Jordan Mayberry says the family was so relieved their new pool was not damaged by Hurricane Irma, since her 12- and 8-year-old daughters love to swim. She pauses to wipe away her tears, apologizing. The family of four is still in this camper because they’re still waiting for their homeowner’s insurance to settle, and they only got $1,500 from the Federal Emergency Management Agency. Mayberry hangs her head at the small kitchen table in the trailer. Behind her, there’s the sofa bed her 12- and 8-year-old daughters share. It’s covered in stuffed animals. Mayberry says that’s hardly a quarter of the girls’ collection; the rest is in the garage with the refrigerator and washing machine and dryer. On the arms of the couch, which are now makeshift nightstands, the eldest has a collection of books, and the second-grader has a pink cardboard castle she’s constructed to hold her school supplies. 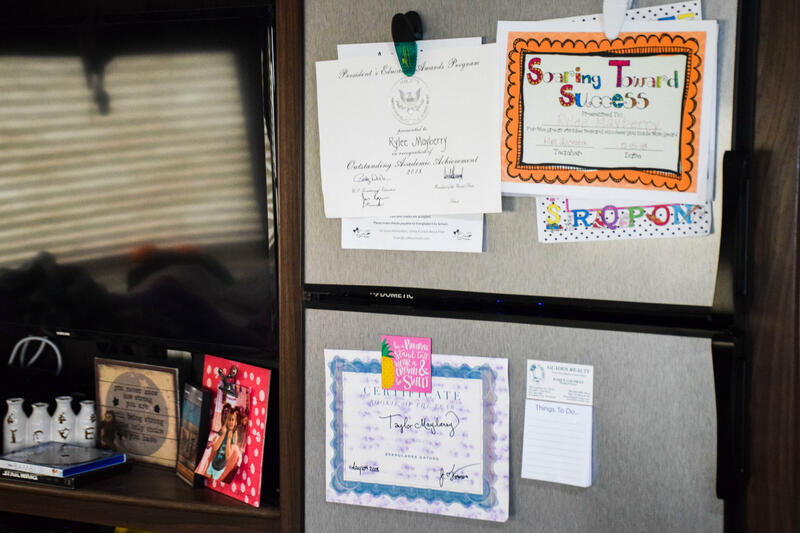 The Mayberry girls' school certificates and accomplishments line the front of the camper's small refrigerator. She says, it’s at Everglades City School where, just after the hurricane and in the weeks that followed, the community rallied. Faculty and staff invited everybody in town to campus to grill burgers and hot dogs. Mayberry says one of her daughter’s teachers even brought over cleaning supplies to try to salvage the house that had filled with water up to the electrical outlets, and with the supplies, she also brought a cooler full of sandwiches and cold drinks. 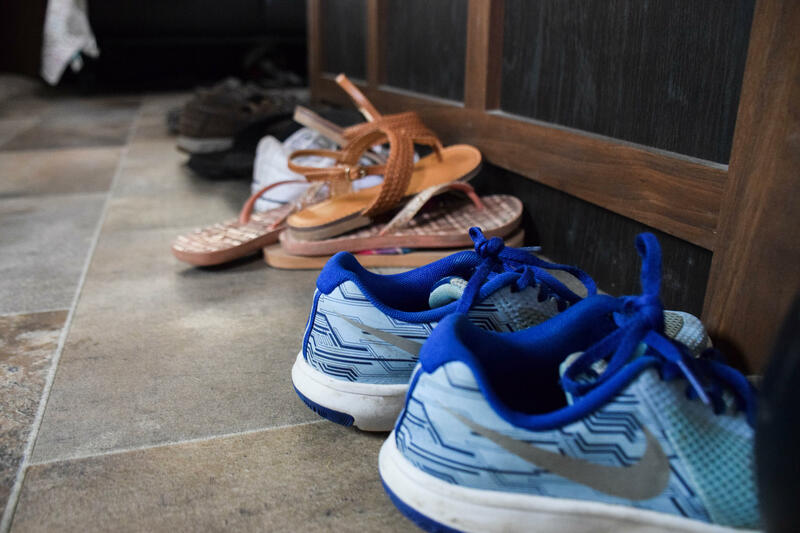 With nowhere else to put them, the Mayberry family's shoes line the front entryway to the camper. The small act of kindness still brings tears to Mayberry’s eyes, and she says, it’s one of the reasons her family never thought twice about staying after Irma. FEMA spokesman John Mills put it this way last week. He said, perhaps just as important as preparing yourself for hurricane season, is preparing your community. FEMA is often the last responders. It took the agency five days to get to Everglades City after Irma – five days of flood waters and no electricity, cell service or running water. Your neighbors are often the first responders, FEMA says, and that could not be more true of Everglades City – then, and now. Hurricane Irma made U.S. landfall more than a week ago, yet some Southwest Florida communities are still without power and running water, such as Everglades City on the southernmost tip of Collier County. The small community is known for its airboat rides and fishing spots — and now, for taking some of the worst of Hurricane Irma’s wrath. 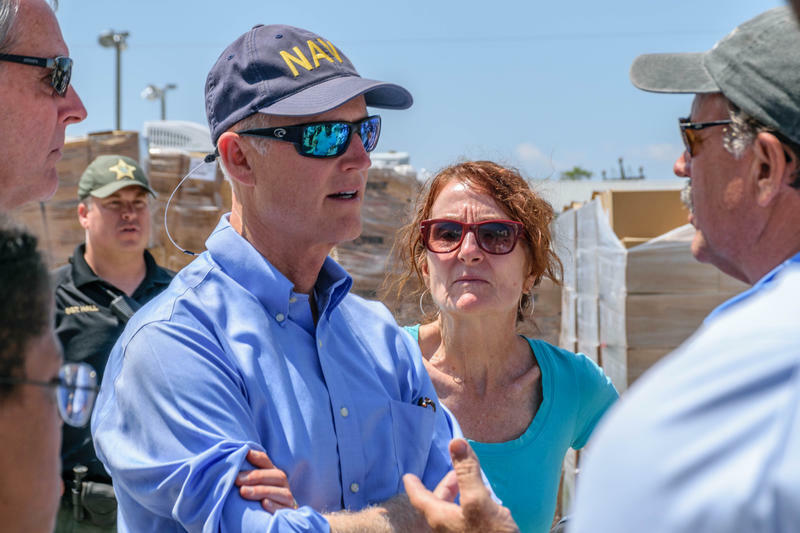 Governor Rick Scott stopped by Sunday afternoon to survey the damage. While most of Southwest Florida is getting back to normal nearly three weeks after Hurricane Irma, in Everglades City in southern Collier County, it’s a different story. The town saw eight to ten feet of storm surge from Hurricane Irma, some homes completely washed away, and those still standing filled by mud, mold, and destruction. The recovery from Hurricane Irma is beginning to dwarf the storm itself: many are still without power, grocery stores are still lean on supplies, and public sewage systems continue to back up into some neighborhoods. 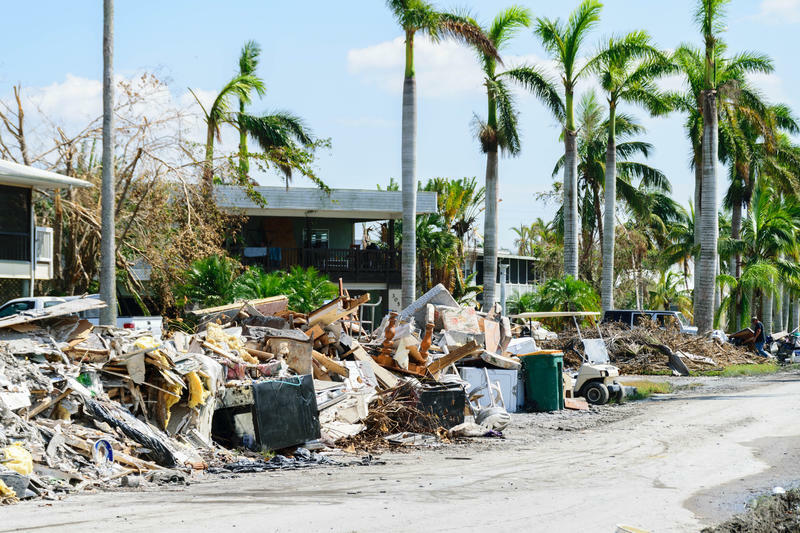 Inland counties like Hendry, and coastal communities from the Florida Keys to Everglades City, still face acute needs that mean a return to routine may yet be weeks or months away. 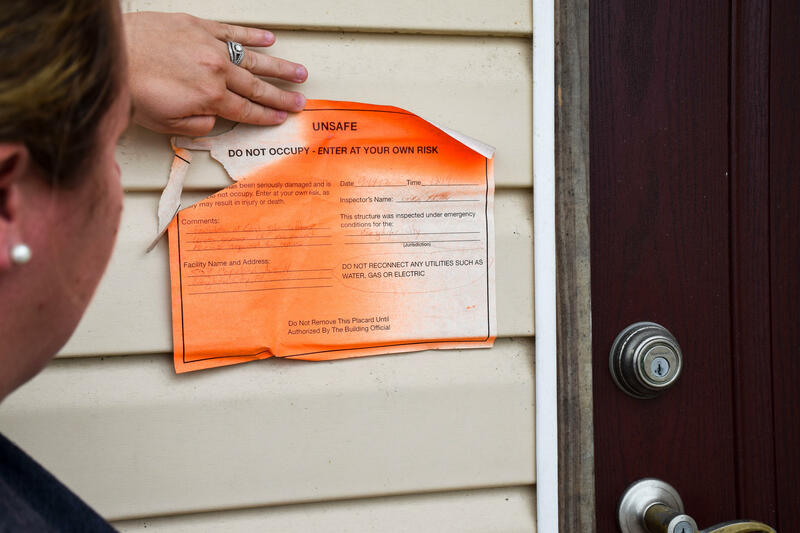 It’s been a month and a half since Everglades City bore the brunt of Hurricane Irma’s storm surge, leaving most of the town’s homes uninhabitable, and there's still no sign of help coming from FEMA.